I mentioned in my last post that I wanted to write some reflections about a decade in the grief journey. I realize that many people are much farther along the path and have much more to offer. I also realize that there are many many books and blogs on the grief journey that are available and I doubt my thoughts are unique or more valuable than others. But I’m not alone in that. Early in my grief journey, several friends gave me books. I understand that – it’s hard to know what to say and a book is at least an expression of the offer of hope and healing. As I read through grief literature I was very blessed by the things written from the perspective of broken hearts. But I also noticed two things. First, these books were repetitive. The principles of surviving grief are not really all that diverse – but they are helpful. A second thing I noticed is that most of these books were written out of personal loss – a shared experience that gave each one a bit of a unique character, even if the principles were similar. So, I consider it a good thing to do to read a book or two about grief if you are suffering a loss. And there’s a new one you should include in your readings. Gary Roe’s Comfort for Grieving Hearts has potential to be a standard among writings about grief. The format is quite unique. The chapters are short and readable – very important for the grieving heart that cannot pay attention long. 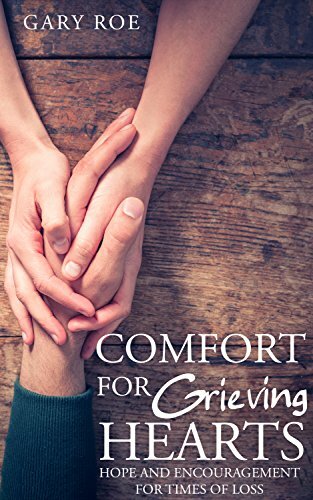 Each chapter begins with a thought from the perspective of a grieving person, followed by a discussion about the subjects the grieving person has raised. Each chapter ends with a grief affirmation, and they are listed at the end of the book. Interspersed throughout are journaling prompts, and they are prompts that really get your mind thinking about an aspect of grief. At the end of the book, Gary Roe shares his experiences with grief. I think he saves it for the end because the focus of the book is not his individual experience. The focus is on the unique experience each of us has had with loss. Although Mr. Roe is a Christian, this is not a book filled with Scripture references and overt references to Christianity… however, a Christian spirit pervades this book. You can confidently give it to a friend who may not be a Christian, but who might be open to discussing that idea later down the line. You can find out more about Gary Roe at his website (HERE). You can find him on Facebook , Twitter , and other social media. Currently this book is listed on Amazon for a very low price, but that could change. Check it out HERE.